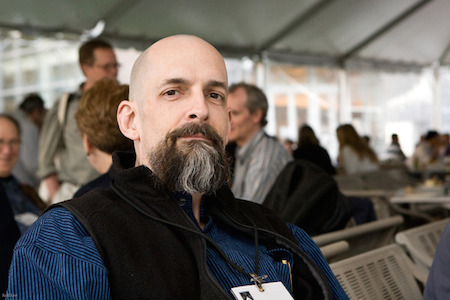 Science fiction author Neal Stephenson has been hired by Magic Leap as their "Chief Futurist. Stephenson said he'd been won over by the project after seeing Magic Leap's eye-fooling prototype technology, as well as its plans. "I saw something on that optical table I had never seen before — something that only Magic Leap, as far as I know, is capable of doing," he said. "And it was pretty cool. But what fascinated me wasn't what Magic Leap had done but rather what it was about to start doing. Magic Leap is mustering an arsenal of techniques — some tried and true, others unbelievably advanced — to produce a synthesized light field that falls upon the retina in the same way as light reflected from real objects in your environment." As "futurist" rather than technologist, Stephenson is working with them on a more theoretical level, and he's devoting his time to "thinking about what to do with this tech once it is available to the general public." So what kind of visionary work has Stephenson already done, that he might bring to Magic Leap? He is wearing shiny goggles that wrap halfway round his head; the bows of the goggles have little earphones that are plugged into his outer ears. The goggles throw a light, smoky haze across his eyes, and reflect a distorted wide-angle view of a brilliantly lit boulevard that stretches off into an infinite blackness. This boulevard does not actually exist; it is a computer-generated view of an imaginary place. I know we're all looking forward to what Magic Leap can bring us, and adding Neal Stephenson to the mix just makes it better. Via TheVerge, and don't miss the almost 60 Neal Stephenson technologies and inventions I've gathered here on Technovelgy.com for you.